Original map created by Geolurking with named fissures. The time frame for quakes is unknown. Now, why is the Dead Zone dead? Because it is really… really hot. Much more than you would think. When an eruption is completed, magma sits and cools after the eruption is over with. This cooling rate depends on the thermal conductivity of the surrounding rock. For Basalt, the heat capacity is 840 J/kg K. (this is what I used in the simulations), Granite, for comparison is 790 J/kg K. This is in part due to its lower density. How it works… in order to raise the temperature of one kilogramme of the material by one Kelvin (same as one degree C), you need 840 Joules of energy (for Basalt). Since we are talking about heat capacity, Water is 4185.5 J/kg K and Ice (at 0°C) is 2090 J/kg, so you can see how water or ice can drastically affect what is going on. This is one of those “gotchas” that can throw this whole scenario off. This area has a high water table and that can seriously affect how accurate the simulations are. Keep that in mind as I continue. Anyway… when a dike intrudes into rock, whether it erupts or not, it starts losing heat at a rate that can be calculated (provided you have the skill or a program written by someone with the skill). Heat3D runs through the iterations of how heat migrates into the surrounding rock. Here is how a single intrusion works out over a few years. In my original set of graphics, I used a temperature of 1600°C magma due to the runniness of the flows and how far they travelled. My original guess was 1100°C based on a statement that I had seen in a paper, and much discussion occurred between Carl and myself about what would be the sane value to use. “Time constraints on the origin of large volume basalts derived from O-isotope and trace element mineral zoning and U-series disequilibria in the Laki and Grímsvötn volcanic system” Binderman et al (2006) places the temp in the 1120–1140 °C range based on a “Mg in glass” geothermometer. (calculating diffusion and formation rates vs temp and pressure). Another reference (that I can’t locate at this moment) implies a temperature of 1200°C at 250MPa for one of the clast minerals. 250 MPa is in the 10 km depth range. Still uncertain of what temp to use, I went with the program default of 1250°C. I used a 10 meter dike width based off of the average of three known dike sizes contained in “Geodetic GPS measurements in south Iceland: Strain accumulation and partitioning in a propagating ridge system” LaFemina et al (2005). This produces a really crappy 95% confidence range of 0.5 to 10.2 meters. 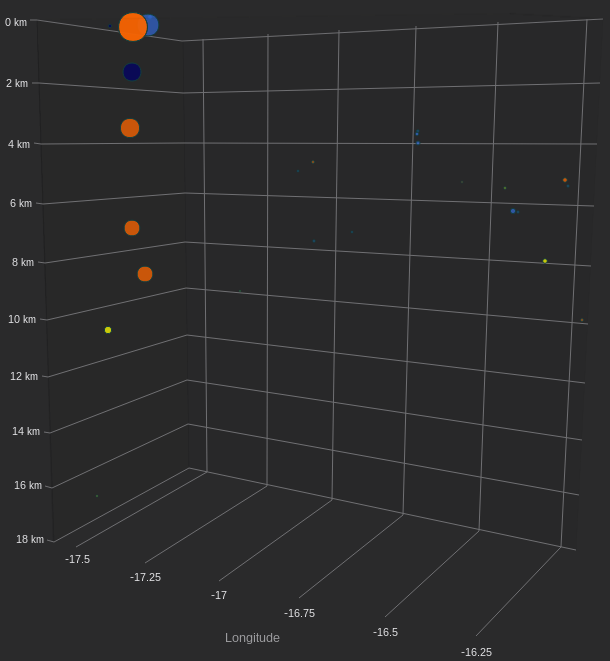 (three samples is horrendous, but it’s all I had) Since the size of the plot grid has a direct play in how long the simulations take to run, I used 10 meters in order to get the simulations done in one evening. Okay… now the actual run. As noted, this is not the original, and for brevity, I focused on only one system, Veidivötn. In case you didn’t know it, Veidivötn is probably the most lively fissure system in the region. It’s responsible for many of the Tungnaárhraun tephra layers. (THc. THd, THe…) GVP places an event there at the following dates: -6650, -4800, -4600, -4550, -4400, -4200, -1200, 150. For each eruption, I placed a 10 meter wide dike and ran the program out until the next intrusion date, which was then added and the process repeated. Another “gotcha” that you should be aware of, the eruptions did not necessarily occur in the same part of the fissure. This simulation assumes that they did. In effect, this skews the region towards being hotter than it might really be (and don’t forget the possible effect of the water that I mentioned previously). So… here is the final product for what conditions may be like under the Veidivötn fissure. The temperature scale from the previous plot applies here. Pretty gnarly eh? This is the crux of why I think that you won’t really see many small quakes in this region. Each one of those fissure lines has a heat structure similar to this. The crust is for the most part, plastic and yields to any stress that comes along… until it arrives too quickly for it to give. Then you have the larger quakes and potentially an opening of the fissure if the conditions are right… such as a nearby parent volcano being at or near erupting and having a ready supply of magma to flow down the rift and open it the rest of the way up. Structurally, there isn’t really much there to hold the two sides together. Plate shifts can do it (tectonic), or a parent volcano. With the increase in sensitivity of seismic equipment in Iceland, the silence of the Dead Zone is now broken (I know it’s a bad pun!) and a much richer picture emerges of this not-so-quiet area. The IMO does a fantastic job of constantly refreshing its monitoring equipment hardware let alone the continual effort required to keep things running in this unforgiving land. All this hard work has given us, the public, access to a fantastic amount of archived data and data in real time. This data has been used by many different graphics and types of visualisation software that frequent readers of this blog will be familiar with. Lately, Andrej Flis has been literally erupting out the graphics and videos using this data, much to the delight of us ‘volcaholics’. The plot below shows all earthquakes in the Dead Zone, between the eastern margin of Torfajökull and the western edge of Vatnajökull for the last twenty years. The majority of the smaller and deeper quakes are from more recent years, purely due to the improvement of the monitoring network. A plot of all earthquakes from 1997 to April 2017 in the Dead Zone. Depth ranges from shallow (light blue) to deep (purple). Plot by Andrej Flis, data IMO. A fair scattering of quakes is shown, but although this breaks the previous ‘silence’ of the Dead Zone, it’s still a whisper in comparison to the loudness of Katla and Bardabunga proper and the South Iceland Seismic Zone. Now, I’m not saying these earthquakes are due to any new activity and that new magma is hammering its way up through the crust and that a Daily Fail sized eruption is around the corner. These quakes could well be the result of crustal extension and therefore tectonic in nature. This area is after all an active spreading zone with rates given as 19.0 +/- 2.0 mm/yr at the NE end of the EVZ to 11.0 +/- 0.8 mm/yr in the SW. The quake activity could also be from slow cooling of the various magmatic intrusions in the crust here, something we can see in real time along the Bardarbunga-Holuhraun dyke path and eruption site and, based on Geolurking’s dyke cooling plots, could continue for many centuries. 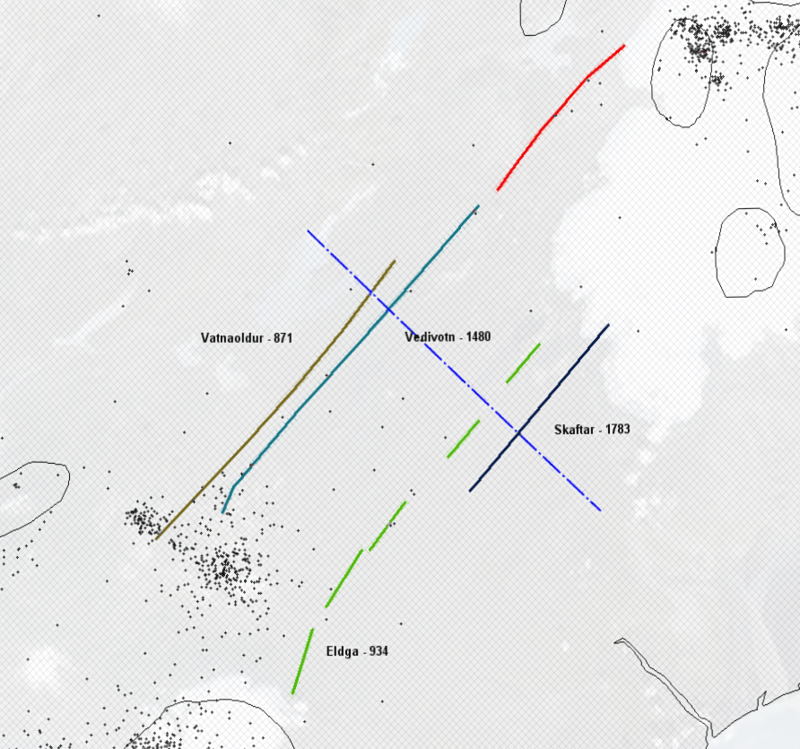 There are some deeper quakes in this mix though which hint at a possibly different origin, the majority of which are on the Veidivötn and Vatnaöldur fissures of the Bardabunga fissure swarm. This fissure swarm is the most active currently with the last fissure eruption being the 1862-1864 Tröllagigar eruption. The map below is part of a long-running project, long-running because I’m easily distracted by other things and also because family life takes up all the other time I have left. In the few minutes, I have every week, I’ve been working on this massive map of Iceland’s volcanic features cobbled together from various sources, to try and build a go-to reference for everything Icelandic, volcano-wise anyway, I’m leaving the fermented shark burial sites alone! The grand plan is to convert the currently static layered graphic into a fully interactive HTML 5 web application in which various layers and features can be turned on and off and feature additional informational ‘pops ups’. That’s the plan anyway… Feel free to comment on this in the meantime with any links to papers with location/eruption details so I can start filling the gaps. In the meantime, this graphic is just to give an idea as to how ruptured this area is, the main culprits for doing so and the lack of an edifice. The ‘Dead Zone’ area as shown on the VC features map. Some liberties were taken with the placement of various features based on papers, images and fissure cone rows in Google Earth. Note: The red-dashed fissure lines are heavily simplified and made up of multiple stages of each eruption and potentially multiple eruptions over a longer time period, many inaccuracies remain. Map by Beardy Gaz and Google Maps, data from FutureVolc, et al. Going back to the geology of the area, I had originally hypothesised that the crust in this area of extension and rifting would be both hot and thin. Hot because of the magma input and thin because of the crustal extension and rifting. We know from the data that the crust in this area will be hotter than average due to the presence of multiple large-scale dyke intrusions and also the proximity to the plume head under Vatnajökull, so that part of the hypothesis was supported by the evidence. The second part of the hypothesis was not supported by the seismic/gravity data from the EUcrust07 model. One caveat though, there is another model in the works using different data, time will tell as to whether this supports or rejects the hypothesis. MOHO plot of Iceland showing the deepest crust under Vatnajökull, but also showing a ridge extending to the SW towards Katla. Map by Andrej Flis, data EUcrust07 model. A SW/NE cross section parallel to the fissures. Torfajökull is on the left and Vatnajökull on the right. Also included is the MOHO boundary. Map Andrej Flis, data IMO/EUcrust07. What’s noticeable about this cross section is the lack of quakes in the centre of the dead zone, most of the activity is clustered around the geothermally active Torfajökull and SW edge of Vatnajökull. Any quake activity here in the centre is relatively shallow with the majority being below 10km. There’s no sign of the deep intrusions common at the central volcanoes, implying that those types of events are very rare here and possibly only occur during major rifting events. The other reason, of course, is heat, the magnitude of which keeps the crust ductile, especially at depth, and so smaller magnitude quakes simply don’t happen in this area. A NW/SE cross section across the fissures. Veidivötn is on the left and Grimsvötn’s fissure swarm on the right. Also included is the MOHO boundary. Map Andrej Flis, data IMO/EUcrust07. This cross section shows the activity clustered around the main fissures, with activity highest at the surface and gradually reducing with depth. As humans, we are very good at finding patterns and shapes in random data, so my next point could be barking up the wrong tree, but from this data, activity appears to be shaped into wedges originating from around 15km depth. Could the crust here be non-uniform in thickness and instead be made up of multiple wedges aggregated together and each new fissure eruption creates a new wedge? Whether this is the case or not, earthquake activity along the fissures may just be related to the high water table in this area and the resulting hydrothermal activity from the hot material below. Now, I’m not an expert in this field so there may be a few holes in my reasoning and the evidence I’ve presented. Hopefully, more data will come to light and we can revisit this in the not-so-distant future and improve both our knowledge and predictions of what this area may produce during the latest peak in Icelandic volcanic activity or beyond. The main intent of this article is to put forward the point that this area produces some of the most devastating eruptions not just for Iceland, but also for the northern hemisphere, and that this area lags behind on research and understanding of the processes in action. After all, the dead zone will almost certainly come to life once more. Could Loki-Fogrufjoll fissure be linked instead to Torfajokull? I was once in the area and the hyaloclastite ridges run all the way between Torfajokull and the edge of Vatnajokull, somehow south of Hamarinn. If the source is rather under Vatnajokull, then I bet in the cauldrons in the area between Hamarinn and Grimsvotn. Hamarinn seems closer to the spot where Veidivotn fissure instead. The area is a wild volcanic desert rich in hundreds (no! thousands!) of fissures, crater rows and hyaloclastite ridges. I find your hypothesis of a thin crust combined with the fact that it´s also ductile, to explain the absense of both earthquakes and a central volcano. Very nice integration! Light in the darkness! The fact that volcanoes are separated from each other, and do not completely fill a rift, is quite a common occurrence. Take for instance the Hawaiian islands. The hot spot heated every part of the track in the same way, for the same amount of time. But the volcanoes formed 100 km or so apart and the equally heated regions in between did not get volcanoes. The best way to visualize this is by holding up a candle, and pulling a bit of polystyrene very slowly over it. I have not tried this myself, but have been told that you get a number of holes in the polystyrene. As a small hole forms, the heat from the candle wafts to the hole and enlarges it. This goes on until the hole is too far away, and the candle heat goes straight up again and makes a new hole. You end up with a series of holes, spaced some distance apart. Something similar is happening in Iceland. The magma has found a way up at Bardarbunga and environment, and at Katla, and this diverts any magma rising up underneath the dead zone. It doesn’t collect there: the upward pressure makes it go sideways to the nearest hole. The fact that the dead zone has lower altitude than the regions either side already tells you there are no significant magma chambers underneath it. Well put! I wish there was a “like” button in the comments here so I could hit like on good comments. On a side note, before it was deemed hazardous, one neat trick was to dissolve copious amounts of polystyrene in Trichloroethane. It’s an “old school” way of making liquid plastic that you could coat (paint) external electrical connectors with to make them water-proof. The solvent is quite hazardous but you would be amazed at how much polystyrene it can dissolve. I once dissolved an entire Styrofoam cooler into about 4 ounces of solvent. Probably one of the better examples of an accurate hazard assessment. I remember the book well… one recipe for it involved polystyrene and petrol as the solvent. Dunno about all that, but I did see a training video on how to administer nitro methane to a tunnel system. Sort of a do it yourself thermobaric explosive used by the army. or just use Toluene. Used to use it for polystyrene dielectric layer in plastic flexible electronics. – Between Askja and Krafla. The region also has plenty of fissures and shield volcanoes. The last lava flood there was in 1874 prior to Askja caldera formation. Similarly to the dead zone, earthquakes occur probably only prior to an eruption. – Between Bardarbunga and Askja. Yes, the region was earthquake-free until early 2014 or so, when small swarms began occuring more often in Kistufell. Of course, we see earthquakes now along the entire dike of Holuhraun. But give it time, and region will fall back to the silence. Thank you Gaz and also Andrej! Both of you have produced really good articles that ponder very deep things. Your articles highlights the importance of understanding the underverse of Iceland. The more we poke at it, the more we understand of this bizarre world where magma is the atmosphere and there are valleys between 30 kilometer high mountainridges. I was about to say the same thing. Once again the quality of the recent posts has been truly exceptional. Thank you All! Thanks for an interesting post. Silence excites!! We had some activity at Mauna Loa. 3.6	2017/04/26 18:37:23 HST	3.1 from the HVO. This was a little south and west of the 2.6 we had the other day. USGS has it as 3.7. And please do not miss the activity at Etna. It is having one of its larger effusive eruptions in a good long time. Grimsvötn now has a seismicity trend graph, with green and yellow blocks like Hekla. Love some Styx! Maybe a little Kansas. Mauna loa update. We had another 3.0 on the southwest rift zone at 3.6km. Just northwest of the 3.6 earlier in the day. There has been one additional small earthquake in the area of the swarm north and west of the caldera. Been keeping an eye on it and it’s actually been in semi-continuous eruption today. Was this from Minima Dake? 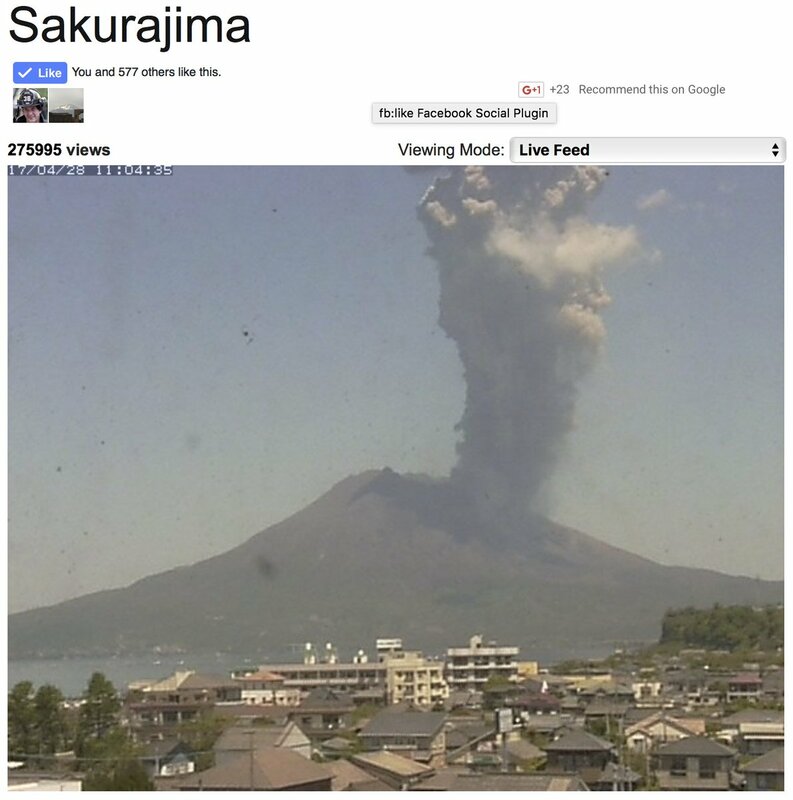 Here’s a webcam of Sakurajima. Here is one of my many cross-sections I made recenty, which shows the Bardarbunga caldera faulting at its finest. Does anyone have an idea why there should be a smattering of low-level earthquakes around the Katla-Torfajokull area? Nothing significant, but why would the area suddenly have so many shallow little quakes and all in a short space of time? I just find it puzzling. Well in my amateur opinion, as far as I know and see, there is an “active” stress field between Katla and Torfajokull, which is also affected by large scale processes. The magnitudes are low and the quakes are shallow and sporadic, which is sonewhat normal for such a stress field. Other causes may apply that perhaps I am not aware of. But I would say its 98-100% not volcanic. Funny how that area is pretty close to the collection of quakes on the SW end of the old rift segments. I’m gonna have to echo what Down Under had to say. And add, that though I don’t know what the focal mechanisms are, I’m gonna guess that they are probably strike-slip, the way most transform faults are that spring up along MAR rift segments. I agree, the whole area is stretched to breaking point, literally. Hmm thank you! Now I understand. Actually – quite relevant to our title. Want to have a good brain tease? According to Global Tectonics 3rd ed, a line tangental to the the transform faults along fault zones, tends to line up with one of the Euler Poles for the crust segments involved. As an example, the transform faults down the gulf of California (bounded by the Baja peninsula) line up with the rotational axis of the North American Plate. A lot of people awake tonight. Got a stretch of severe weather from Oklahoma, Missouri, Illinois, then on up the Ohio River. We had a tornado warning here. Our electric went out 4 hours ago & just came back. I know other states are being affected too. For those involved stay safe. Oh how I wish we had some. Strong storms make me sleep like a baby. Not the colicky sort, just sound and quite. Which also plays into my idea about how to have 100% probably of survival of a catastrophe. “Don’t be there” when it happens. Been in that situation… once. Entire front of the house was bouncing up and down on the foundation pillars and it ate half the roof. My philosophy is that if yer gonna get whacked, there isn’t a whole lot your gonna be able to do about it other than hunker down. It was your own idea to be there to begin with. It would cost relatively little to have a small bunker underground that would protect your family from death or injury, yet even in tornado country, these seem to be quite rare. Why is this? Tornadoes are common here whenever cold and warm fronts meet. Or should I say clash. :-) Here in Indiana some of us have basements. It’s important tho to be under a workbench or a sturdy table, in case of falling debris should your home be hit. 5 years ago, not far from here 3 people were killed when an EF3 tornado hit a little town. So far I’ve been blessed by only having minor property damage to the house or trees being blown over. I had cousins loose their home but they weren’t harmed. Another round is coming through. A lot of flooding. Usually this time of year the rivers get high. Pain in the arse, mainly. Plus, you have to make sure that snakes haven’t taken up residence there… and, placement of the thing would require you to make sure that it didn’t interfere with the house’s septic system. Plus, most people aren’t fond of having their yard torn up by a work crew of dubious integrity. In the event that I noted, we only had about 5 minutes lead time to do anything. I was monitoring the weather radio and noted that a funnel had been spotted 9 miles south of Raleigh MS and I knew that it was about 9 miles west of me. Tornadoes in this part of the country typically travel due east or north, and that relative position put me right in the center of the likely travel path. I went out on the front porch and looked around. The lightning was intence enough that you could read a newspaper, then I noticed a dark area where there was no lightning… getting larger. At that point I went into crisis mode, barking orders at my family and scrambling about to get some sort of relatively secure spot. In retrospect, I chose poorly, but lucked out. The south end of the house was much older and more firmly embedded in the hilltop and would have been the last portion to come apart. The only smart thing I did was securing the electrical mains to the house. I had a mental vision of extensive tube and post wiring in the attic and did not know if they had ever been upgraded to modern wiring. You think about weird stuff when everything goes bad fast. Interesting. Do these storms go on for days, or are they three hour events? If days then nobody will take much attention, if three hour then that’s another matter. I suspect that the UK would have them as a requirement in building controls, certainly a tornado-resistant room. There again our houses already cost $$$, much of which is building controls (admittedly mostly sensible). Generally short one shot events… typically a front moving through the area. Out in Oklahoma there is a different dynamic and the tornadoes can be quite large. In the Southeast, F3 is about the most intense that can occur since everything is moving so fast. Not all advancing fronts can make them. “Bow Echoes” are usually a good indicator that conditions are ripe for formation. A bow echo is when part of the advancing front pushes out faster than the rest of the squall line. On the northern end where the air is moving back in towards the front, you can have a twist to the air that can spawn one. Doppler Radar is the best warning indicator. As for how often they occur, I’ve lived in the SE US for 55+ years and have only had one really close tornado. That comes out to about 0.000052% chance of getting hit when you consider it to be about a 15 minute encounter. …and all the favorable probability in the world doen’t mean squat when it’s your time. Yep, use that quite a bit to watch the overall trends. This is what I use for Doppler imagery. Less adverts and unneeded java script. Personally, I have a pet theory as to why we don’t get more tornadoes here. I think it has to do with the turbulence of the land as the air comes ashore. North of here, starting in about Cantonement-Molino area and north into Alabama, the storms usually are kicking arse. The coastal regions (Perdido Key, Gulf Breeze and such,) only have to really sweat land-falling waterspouts. Oh, and during Hurricane season, the tornado threat can come from the other direction as feeder bands make landfall. Something to keep in mind if you are in a tropical storm landfall area. WoW that lightening is amazing! One of the reasons that pine is the dominant species of tree down here. They are better adapted for ground fire. In fact, some varieties need fire to get the seed pods to open. As for the Hurricanes. A lot of preparedness statements talk about food and water and buy this or buy that. My preparedness steps are to secure anything outside that might blow around, and to keep full fresh and sealed 5 gallon plastic water cooler jugs around, a propane grill and a large sack of potatoes. Pretty much any dry goods will help you out until the grocery stores are available. Don’t count on FEMA, they will just muck things up and destroy any cobbled together supply system you have arranged in the aftermath. Yeah, they will get the traffic lights going again… until someone steals the generators they have put in place to temporarily operate them. 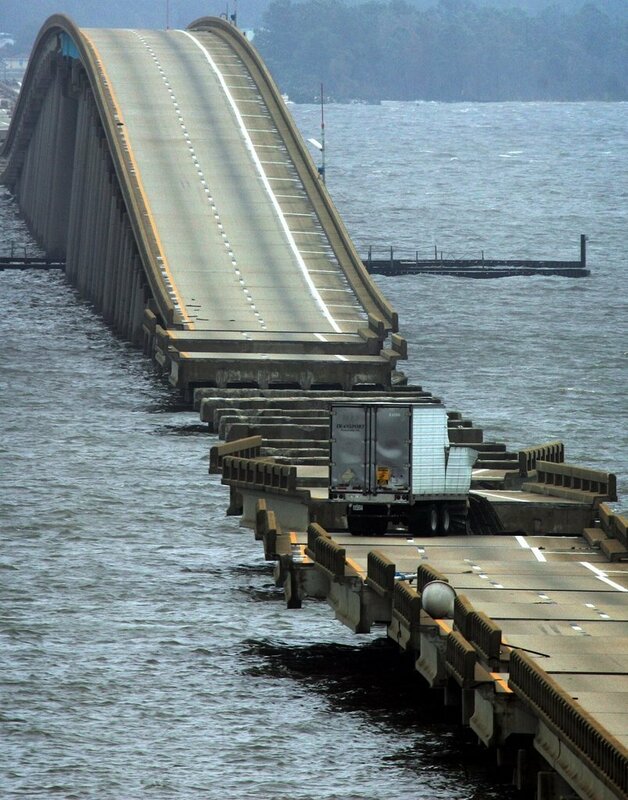 BTW, what took out the bridge was likely an interference pattern of the waves bouncing off of the shores of the bay. Authorities have stated that the swells inside the bay were not large enough to lift the slabs, so that is about the only way that this could have happened. The run-up to the replacement bridge is much higher… and is actually just an early implementation of the upgrade that they had intended for this stretch of highway. I didn’t realise that’s wheree you are. Not the easiest place to service a large area from. Weather, by UK standards, must be ‘demanding’ particularly if aircon fails. After Ivan I had no electricity for 5 weeks. You quickly revert to your childhood methods of staying cool. Minimal light loose clothing and shade… drinking lots and lots of water. One of the few luxuries I allowed myself was a fan run off of my generator. I have a screened in porch and that was were I slept. Mind you lots of water and a good fan are very under-rated, even in high humidity. I’ve had surprisingly good sleep with a strong oscillating fan and no aircon in the tropics and had a much nicer and more interesting time in cheap local ‘hotels’ than the 5* deluxe where you could be anywhere in the world. Everyone talkes to you and have interesting stories to tell whilst in a 5* you never get to meet anyone. On the other hand a really good shower is appreciated. A screened porch, well that’s luxury indeed! New post is up, continuing our dissection of Iceland.